Royal Engineer soldiers, who helped install British Steel track, and dignitaries at the Llanelli & Mynyd Mawr Railway. This heritage railway is on the site of the former Cynheidre Colliery in Carmarthenshire, and has recently been a hive of activity as members of the Army’s 507 Specialist Team Royal Engineers (Rail Infrastructure, 507 STRE) have been laying rail as part of a training exercise to extend the route. The 507 STRE are the Army’s only railway infrastructure specialists. The railway was fortunate to be able to combine their training exercise with the railways need for extending the line. 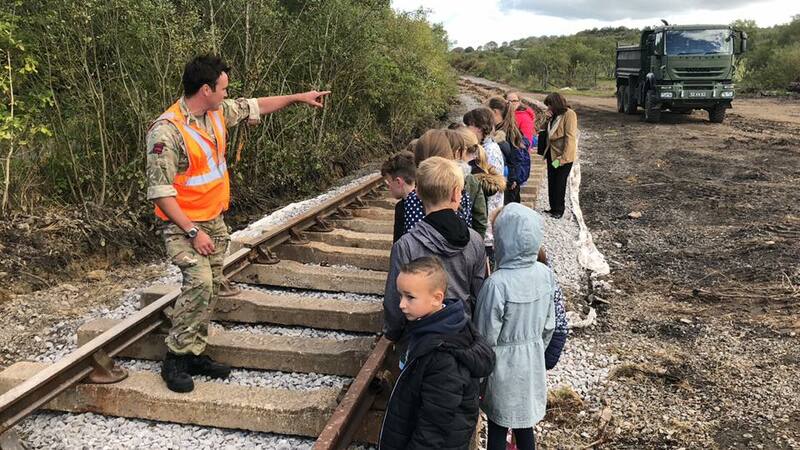 Despite being busy laying rail the 507 STRE also took time out to show visiting local school children how the railway was being built and inspire a future generation of rail engineers or Royal Engineers. Darren Cole, British Steel’s UK Supply Chain Account Manager Rail, said: “We’re delighted to be supporting the extension of the Llanelli and Mynydd Mawr Railway. Nia Griffith MP Shadow Secretary of State for Defence and Member of Parliament for Llanelli since 2005 visited the railway to see the excellent work that Specialist Team Royal Engineers had been carrying out.